By now it goes without saying that Prime Minister Stephen Harper and Liberal Leader Justin Trudeau don't always see eye to eye. But it appears they both respect each other as fathers. 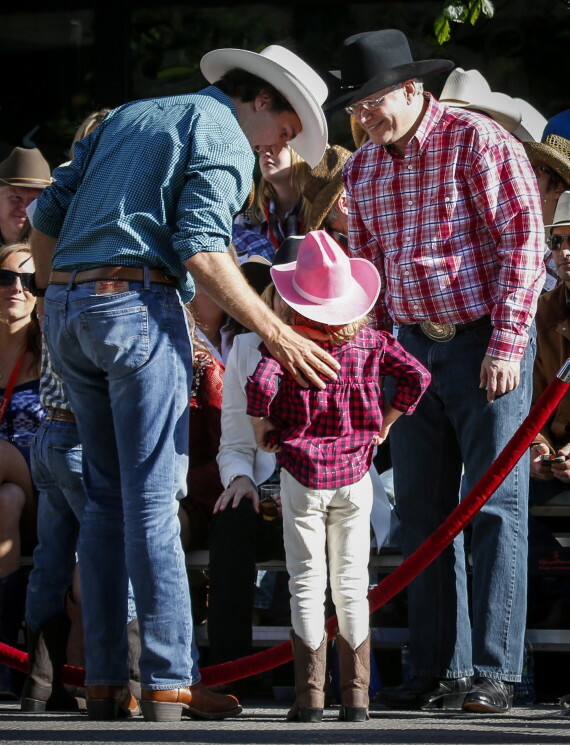 On Friday, while both leaders were taking in the Calgary Stampede parade, Trudeau introduced his six-year-old son, Xavier, to the prime minister. The nice moment was captured by Trudeau's photographer, Adam Scotti, and shared on Twitter. "Nice to introduce Xavier to the Prime Minister," Trudeau wrote, adding it was good of Harper to say hello. The prime minister also met Trudeau's five-year-old daughter, Ella-Grace. The moment may remind some of a story Trudeau shared in the eulogy for his father, former prime minister Pierre Trudeau, back in 2000. Trudeau said that when he was eight, he spotted one of his father's "chief rivals" — believed to be former PC leader and prime minister Joe Clark — eating at a parliamentary restaurant. Thinking it would please his dad, Trudeau told a "silly" joke about the man. It didn't go over well. My father looked at me sternly, with that look I would learn to know so well. And said: Justin, we never attack the individual. We can be in total disagreement with someone, without denigrating them as a consequence, and, saying that, he stood up, took me by the hand and brought me over to introduce me to this man. He was a nice man, who was eating there with his daughter, a nice-looking blond girl, a little younger than I was. He spoke to me in a friendly manner for a bit, and it was at that point that I understood that having opinions that are different from another does not preclude being deserving of respect as an individual. Because simple tolerance, mere tolerance, is not enough. We need genuine and deep respect for each and every human being, notwithstanding their thoughts, their values, their beliefs, their origins. When Trudeau's wife, Sophie Grégoire, gave birth to the couple's third child in February, both Harper and NDP Leader Thomas Mulcair offered congratulations online.
.@LaureenHarper and I would like to congratulate @JustinTrudeau and Sophie on the birth of their new son Hadrian. Congratulations to Sophie and Justin on the arrival of baby Hadrian. Wishing you all health and happiness. Some things, as they say, are bigger than politics.